Where on my bike is the "swing arm pivot"? The swing arm pivot is located towards the centre of any bike. However within this central area of the bike its common to find other frame mounts, holes and recesses so checking that you are fitting the product to the "swing arm pivot" itself is essential. If you are not familiar with this point it can be easily recognized by running an imaginary line from the rear wheel axle (centre of rear wheel) up to where the swing arm supporting the rear wheel meets and is bolted to the main motorcycle frame. The picture above (click to enlarge) illustrates the swing arm pivot on a Triumph Street Triple. Occasionally on some motorcycles you will find a small plastic cap or bung on either side of the swing arm pivot. These are purely there for cosmetic purposes and can easily be removed and re fitted after use. What are the Advantages to lifting on the "Swing arm pivot"? This area is one of, if not the strongest point on any motorcycle as it connects the two main parts of the motorcycle chassis together. Fitting the stand to the "pivot" bolt itself means no part of the stand/lift comes into contact with the actual frame or swing arm. This eliminates the very common scratches caused by using a paddock stand or other similar stands. With the stand lifting near the "centre" of the bike, this makes easy access to the rear end for wheel removal, chain lubrication and cleaning. Relieves stress and compression on the suspension, perfect for long term and winter storage. Is this point strong enough to support the weight of my bike? As mentioned above, the swing arm pivot is an extremely strong point of the motorcycle and could easily support twice the load that is applied using our products. How long can the the bike be supported safely in this position? Indefinitely! Whether its one day or one year it makes no difference. Storing your bike in this way is the best solution for long term and winter storage. I have a single sided swing arm on my bike, does this make any difference? 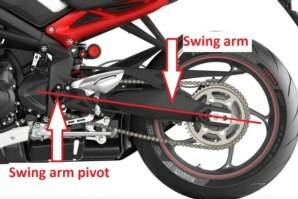 No, although the swing arm itself only has a "single" arm, the pivot point is still located on both side of the motorcycle in the same way as a conventional swing arm machine. This is another advantage of our products, unlike a paddock stand the same abba stand or lift can be used on both single sided and twin sided swing arm motorcycles without the need to purchase a new stand. General gallery images click here. Sky Lift Gallery images click here. If you need any more specific information on this topic or have any other questions please feel free to contact us.